Quezon City, Philippines – Amidst the hustle and bustle of the Christmas season, it is easy to get caught up in all the shopping and gift giving. Arlington Memorial Chapels believed their guests and families needed a reminder that Christmas is not about how expensive or fancy a gift is but about the act of giving a gift. After witnessing a year filled with negative events around the world, Arlington Memorial Chapels felt the need to put a positive light on the season by creating their Tree of a Kind. In a world that has dealt with war, climate change disasters and bombing attacks, it’s important to understand the impact that has had on us and how in turn we impact others. 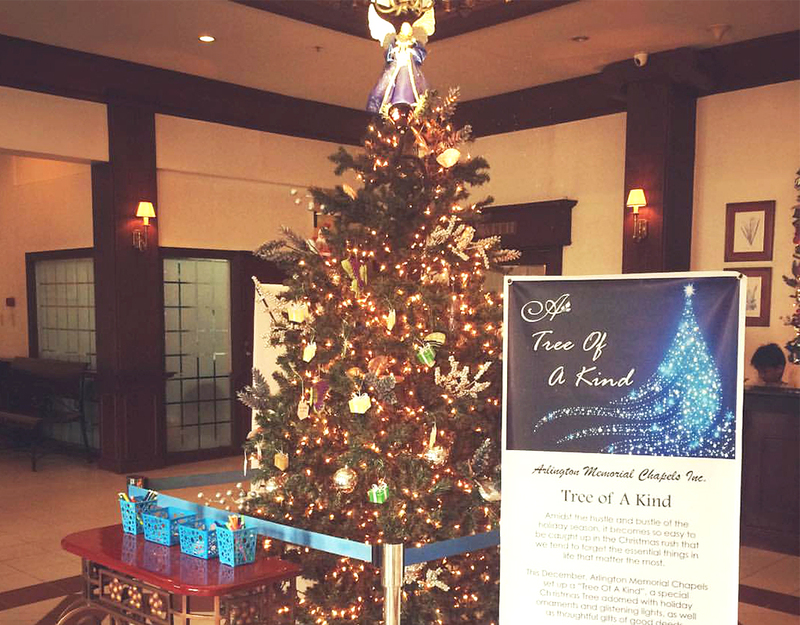 The Tree of a Kind is meant to bring joy and random acts of kindness to Arlington Memorial Chapels’ community. They believe that by creating a positive atmosphere it can create a ripple effect and lead to a more positive world. Arlington Memorial Chapels chose to light The Tree of a Kind December 4th to honor their funeral home’s founder on the anniversary of his death. Following the lighting of the tree, visitors to the funeral home were encouraged to hang an ornament on the tree. The ornaments were made from cardboard shaped like gift boxes. Before hanging the ornament, guests were asked to write their act of kindness on the back of the ornament and hang it on the tree for others to see. Through writing an act of kindness on the ornament for others to read, this would help those who wrote them get in the Christmas spirit. Even if they did not write a message of their own, just reading the different acts of kindness can inspire others to do simple acts of kindness themselves. There may not be an exact number of how many people the Tree of a Kind touched but Arlington Memorial Chapels believes that by doing this they have created one small ripple effect in this world that will hopefully spread. In the future, Arlington Memorial Chapels hopes that other funeral homes will follow in their footsteps to making our world a better place. This entry was posted in The Good Funeral on April 4th, 2018 by ObitTree .